Bollywood veteran Manoj Kumar says he has fond memories of legendary singer Mahendra Kapoor, who sang many songs for him including National Award winning number "Mere desh ki dharti" in "Upkar". "I shared many memorable moments with Mahendra Kapoor. I remember him everyday, after all he was my voice," Manoj said in a press statement. Mahendra died following cardiac arrest Sep 27, 2008. He was 73. Some of his timeless hits are "Neele gagan ke tale", "Ae jaan-e-chaman tera gora badan", "Dil lagakar hum ye samjhe", "Aadha hai chandrama", "Din hain bahar ke" and "Tum agar saath dene ka wada karo". In a career spanning over four decades, Mahendra sang many hit songs in various regional languages. 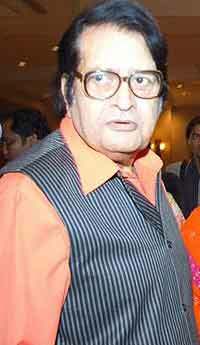 While he sang many songs in Hindi for actor Manoj Kumar, he was also known as the voice of Marathi actor Dada Kondke. "My father shared a very special relationship with Manoj Kumar. It is probably their mutual bonding that helped the duo create some very special numbers," said Mahendra's son Rohan who is now planning to compile his father's last few compositions in a new album. "Before his demise, my dad had conceived some music tracks. In his memory, I will create an album out of these tracks in the near future," he said. Rohan, who plans to visit an old age home to spend some time with senior citizens on his father's death anniversary says his father was an entertainer at heart. "Dad had a humorous side to his personality that many people are unaware of. We always enjoyed his jokes and anecdotes. He was also a great impressionist and often impersonated people flawlessly," said Rohan who will also sing some of his father's songs for the senior citizens.